Portland Cement Association has named Michael Schon vice president and counsel for Government Affairs. He will have lead responsibility for shepherding the association’s regulatory advocacy efforts and promoting the cement industry in general. He joins PCA from Baker Botts L.L.P., where he served as Environmental Practice Group senior associate, representing energy and manufacturing clients in environmental litigation, while providing regulatory guidance and counseling for federal and state environmental issues. Prior to his work at Baker Botts L.L.P., Schon served as trial attorney for the U.S. Department of Justice, and was a law clerk in the Arizona Court of Appeals. He holds his Juris Doctor from Arizona State University College of Law, and a baccalaureate degree in philosophy from Northern Arizona University. Past PCA Chairman Cary Cohrs was recently elected Florida Concrete & Products Association chairman, following terms on the FC&PA board and executive committee. He is the current chairman of the CTLGroup and president of American Cement Co. in Sumterville, Fla. In addition to serving as a long-standing PCA director, he co-chaired the Manufacturing Technical Committee and was local chairman for the 2002 IEEE/PCA Cement Industry Technical Conference. Other professional experience includes positions as plant manager, construction manager, and vice president of Operations for Florida Rock Industries, and corporate project manager for Essroc Materials Inc. Separately at CTLGroup, the inaugural W. Gene Corley Legacy Award was presented to John Gajda, recognizing expertise he provided on Los Angeles’ Wilshire Grand Center, where crews set a new world record for a continuous mat foundation pour (21,000-plus yd.). The award honors the late CTLGroup Senior Vice President Dr. Corley, P.E., a pioneer in structural and forensic engineering. Gajda was selected amongst a pool of CTLGroup staff nominees who demonstrated contributions to the engineering and materials science profession. The Wisconsin Ready Mixed Concrete Association is accepting through December entries in its 34th Annual Concrete Design Awards, showcasing best uses of ready-mixed concrete in Wisconsin and Michigan’s Upper Peninsula (UP). Joining WRMCA in program sponsorship are Acuity Insurance, Holcim, Ozinga Ready Mix Concrete, and ACI Wisconsin Chapter. Award winners will be determined by a panel of Wisconsin/UP educators and construction professionals. 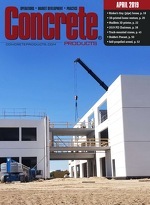 The program recognizes excellence in the ready-mixed concrete industry in such categories as Agricultural, Commercial, Decorative Commercial, Decorative Residential, Education, Healthcare and Public, Environmental Management, Insulating Concrete Form, Industrial, Municipal Facilities, Municipal Infrastructure, Overlays, Parking Lot, Pervious, Residential, and Site Cast Tilt-Up. Projects supplied by a WRMCA producer member and that have been completed in 2014 or 2015 are eligible for entry. Engineers, architects, contractors, project owners, developers, and producers are encouraged to submit entries, with forms posted at www.wrmca.org. Additional information on the program can be obtained from the association’s Cherish Schwenn, 800/242-6298, [email protected]. The proposed ASTM WK50586, Practice for Measuring the Electrical Resistance of Fresh Concrete standard will show how to sample a load, prepare a mix specimen for evaluation and conduct measurements—the latter yielding information on water-cement ratio, initial setting time, compressive strength, and overall concrete quality. “These metrics are critical to scheduling construction projects such as finishing and form work removal, as well as verifying consistency of ready-mix concrete,” says ASTM Committee C09 on Concrete and Concrete Aggregates member Dale Bentz, a chemical engineer at the National Institute of Standards and Technology. An ASTM C09 task group is preparing the new standard for balloting, and invites participation from interested parties. The standard will be included on the ASTM C09 agenda for December 6-9 Committee Week in Tampa, Fla. Contacts: technical, Dale Bentz, NIST, Gaithersburg, Md., 301/975.5865, [email protected]; staff liaison, Scott Orthey, 610/832.9730, [email protected]. Launched in February 2015, the Decorative Surface Solution Group has chartered with 12 members from California, Alabama, Michigan, Minnesota, Utah and Wisconsin. All aim to closely connect the industry’s best suppliers with the premier contractors across several decorative flooring channels to achieve market leading growth through collective sourcing programs and national marketing services. In addition, the DSSG network exists to partner specialized contractors in each market place delivering best in class flooring solutions. “We chose to join DSSG because their business proposition, leadership and mission are perfectly aligned with where we see the industry going. We have been positioning our company in this space for years and see DSSG as the way to take us to the next level,” notes Lance Boyer, president of California-based Trademark Concrete. “I’ve known several of the Founders of DSSG for years and their business philosophies and ours are the same: We want to see our industry thrive and prosper and drive support to the manufacturers whose goals are the same,” adds Steve Bulach, president of Bulach Custom Rock in the Twin Cities.